So I've been at my new job in Outreach on the Storytime Bus for almost two months now, and it has been a bigger adjustment than I expected. 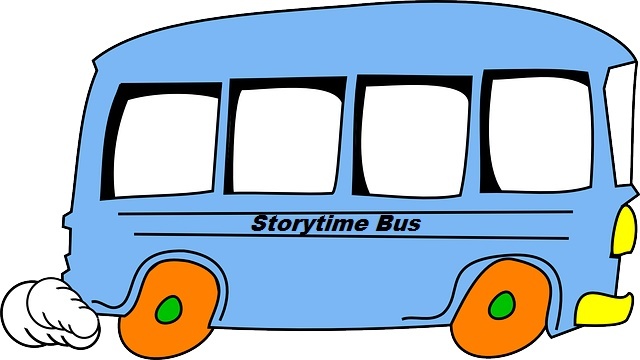 The storytime bus serves approximately 30 different daycare classes, with 10-12 kids per group during each 2-week rotation. That's at least 300 different faces, and we only see each one twice a month. So in the beginning it was just an overwhelming blur of kids, yet I didn't feel like I got the chance to connect with any of them, and it all felt rushed. It's just such a very different environment than being in the library and interacting with families, parents, kids of all ages, and having more opportunity to interact with them one-on-one. So at first I felt like I was just going through the motions, not hating it, but not enjoying it that much, either. I was feeling pretty homesick for my old department, but at least I still get to go back one afternoon a week and work the service desk in the children's department. This is very important to me as it allows a change of pace and more variety, and lets me keep up on all the middle-grade and teen lit and stay in practice with reader's advisory and customer service. But after about 4 weeks, things started to turn around. I started feeling more comfortable with the schedule and not worrying so much about the time, and more comfortable with the volunteers. Then I was able to relax a bit and started enjoying it more, and realized I was starting to recognize several of the faces, even remembering a few names! I'll probably never learn them all, or even half of them, but I will do my best. Another thing that hit home was when I was talking with my former supervisor about how I felt like they were all just a blur and I wasn't really connecting with them, and she reminded me that while I might not be able to remember all of them, they will remember me and the experience they have on the bus. It is a learning experience and definitely an opportunity for professional and personal growth. I have a great deal of responsibility and independence. I do all the scheduling, select the themes, make sure all materials get to and from the bus, and I will be doing quite a bit of collection development, which I'm really looking forward to. I am the primary point of contact with the volunteers and will help with training new volunteers. It felt a little strange at first to be working so independently and only touch base with my manager once a week or by occasional e-mail, but I appreciate the amount of trust she has in me. One thing I have learned is how to "wing it". In the past, I planned my storytimes far in advance, every detail, and tried to memorize the books so I wouldn't have to look at the pages. I could do this because I was only doing 2 storytimes a month and had the luxury of time. On the storytime bus you just can't do that, as you have to adapt to not only each group of kids that comes on, but to the volunteer that I'm working with that day. And I would get bored out of my mind if I did the exact same thing with each group, so we are always mixing it up. So now I am much more comfortable with much less planning and have learned to change and adapt on the fly. As the kids have just moved up to the 3-year class are still on the young side and not quite settled in, I am still keeping it a little shorter and just doing two books. We started with our welcome song, which we did twice since most of them didn't know it yet. Then I asked them to guess what our topic was, and then told them I'd give them a clue and put on a bandana, followed by a cowboy hat, but they still didn't get it. 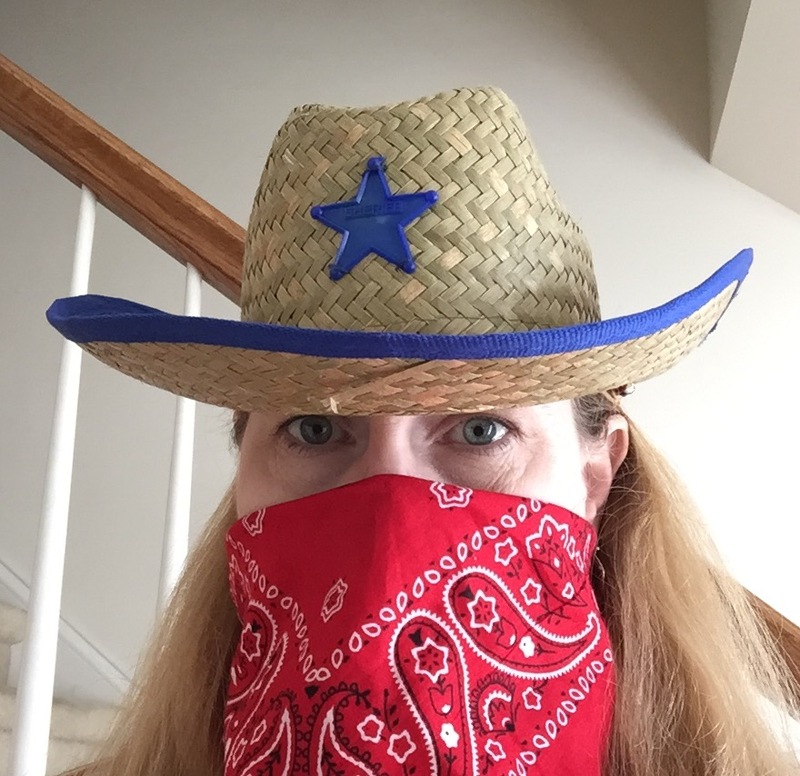 So I explained about cowboys, and how the bandana was used so they could breathe without getting all the dust in their mouths and noses. We led into our first book with our "story song", to which I added a couple of cowboy-related verses, like "say 'Yee-haw'". 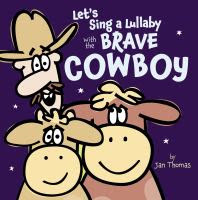 For our first story I chose Let's Sing A Lullaby With The Brave Cowboy" by Jan Thomas, because it is short, funny, and very engaging. Another thing I like about it is that I can cover up my terrible singing by using a heavy cowboy twang :) Jan Thomas's books are always a big hit for storytime because they are funny and very interactive, and they also have nice, simple bold illustrations with heavy black outlines. The simplicity and high-contrast really attract and hold attention better, especially with young children. 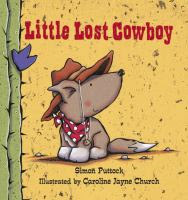 For our second story I was torn between Lost Little Cowboy by Simon Puttock and Are You A Horse? by Andy Rash. I wish it had been later in the year when they could have handled three stories. But in the end I decided on Lost Little Cowboy because I really liked the artwork and I knew the kids would like howling along with Cowboy Coyote and would empathize with his misfortunes. I also wasn't 100% sure they would truly appreciate the humor in Are You A Horse? at this young age. Then we ended with our usual closing song, and I gave them all stamps of a horse. I tried to prompt them by asking who wears a hat and bandana like that, but no one guessed it. Clearly cowboys are not big in pop culture any more. I wonder if I'd thought to bring up Woody from Toy Story if they would've gotten it? So, I had to explain it a little, and I really wished I had thought to find a good non-fiction book with a couple of pictures to show what cowboys did and how they dressed. Oh well, hindsight is always 20/20, isn't it? They really liked "Let's Sing A Lullaby With The Brave Cowboy," and some even asked to read it again. They didn't sing along to the song as much as I'd hoped, but I did hear several humming along and a couple trying to sing, and they REALLY got into reacting to the cowboys imagined fears. Like the cowboy, by the end they figured out the pattern of something that looked scary turning out to be harmless, and they too thought the wolf was going to be something else. They really laughed at the wolf putting on his nightcap & jammies and snuggling up with the cowboy and cattle for a lullaby. And we all agreed the cowboy really wasn't very brave, after all. Lost Little Coyote might have been just a tad too long for them, and I had to first explain that there wasn't an actual cowboy, that the coyote pup's name was "Cowboy". But they did feel sorry for him being lost and hurting his nose on the cactus and predictably enjoyed joining in with all the howling. One little girl was obsessed with the moon, and kept worrying what happened to the moon on every single page that it wasn't shown. And they were all glad his mom found him in the end. They also seemed to like the "Ten Little Cowboys" fingerplay more than the "I'm A Little Cowboy" song, and I had kind of expected the opposite. Sometimes you just never know.... I wish I could have done a felt board, but their just really isn't enough room to maneuver in this particular classroom. I noticed during the second story the teacher left the room, and at the end I realized she had gone to make copies of a coloring sheet she had that fit the theme with a desert scene and rattlesnake. That's always a huge compliment to see the teacher extend what I have started. This class is a very talkative class and still needs a little reigning in, but I think they are going to be a lot of fun and I bet it's not long before they settle into the storytime routine and we can start to stretch it out little by little. This was the second week for our "colors" theme, and we used most of the same books as last week. Again, Pete The Cat, Lemons Are Not Yellow, Snappy Little Colors, Mouse Paint, Monsters Love Colors, and Brown Bear, Brown Bear were the biggest hits. You can always tell the kids that already know Pete The Cat because they will be the only ones to answer "Goodness, no!" instead of just "No!" when you ask if Pete cried :) I gave Spicy Hot Colors one more try, but it just did not work; the kids had no interest in it at all, except for the page with the skeletons. I finally had one class that had not one, but two or three kids that knew what the mole in Snappy Little Colors was; no one else in the whole 2 weeks knew what it was. That class was also the one with a kid who piped up and said "It is during an eclipse" when reading the part about the moon not being black in Lemons Are Not Red. I did have one class that I just could not get engaged no matter what; this was the first time I had ever seen a Snappy pop-up book not be a huge hit. Part of the problem was that they were a bit too young. 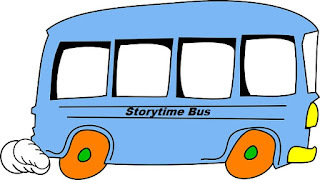 The minimum age to come on the storytime bus is 3, but at the beginning of the year, half the kids that are in "3-year old" classes haven't actually turned 3. Also I think it was the first time several of them had been on the bus, and the first week in that class or maybe even at daycare. Some seemed apprehensive, one even started crying, and several others seemed like they had never been read to before, which is a little sad. But these are the kids this program was developed to help in the first place. Not to mention the "teacher" was very young and didn't participate or engage herself. Next time we have this particular group, I'm going to try sticking with simple board books and sitting in the floor with them (as much as this middle-aged body doesn't want to) and try to make it more intimate and cozy and try to talk to them one-on-one. However, the second group at the same daycare, was the complete opposite. They were so excited to be there, enjoyed the stories, sang along with Pete, and a few joined in with reading Brown Bear. They listened and participated very well, and loved the Mouse House flannel game, which I will describe in more detail below now that I have pictures of our particular pieces. They were so much fun, and enjoyed everything so much, it made my day. So, now I have pictures of our "Mouse House" flannel board (I inherited it). As you see, there are houses of different colors and you hide the mouse behind one. The set also had an orange, apple, and cheese pieces. I'm not sure what the original intent for these was, but I go ahead and hide those, too. I put the mouse behind the apple, under the last house on the board. I tell the kids that I saw a mouse scurrying around earlier and I think it hid in one of these houses and ask them to help me find it. Then one by one, we say together "Little mouse, little mouse, are you in the (color) house?" and peel back the house. I like to try to build the suspense and just peek, then put it back down, and if it's the one with the orange or cheese, I say "I see something in there!" and then when revealed say the mouse must have hidden it there to save for a snack later. When we peel off the last house, which everyone is sure MUST have the mouse, and show the apple, I play dumb and say, "Oh, it's just an apple. Where did that little mouse go?" Then watch as the kids observe the ears and feet peeking out and tell me to look behind the apple. It is amazing how much every class loved this! You can also hide it randomly and let the kids take turns picking a color, which I did with a couple of small groups, but it seemed like they had more fun the other way. I plan to add at least two more colors and a couple of other random objects to hide as well. Out of all the activities we did, I think the kids enjoyed this one the most, as did I, though they all seemed to like the "If You're Wearing Red Today..." song as well, except for the one class that just seemed too young to get it. On the very last day for this theme, 3 out of 4 classes all had one new kid who was having a hard time adjusting and dealing with separation anxiety. One little girl starting crying as soon as she came on, and when I took her hand to ask her what was wrong, she threw her arms around me, looking for comfort even though she had never seen me before. I felt so bad for her. She didn't want to sit in the floor with the rest of her class, so I let her pull up a little chair next to me and told her she could sit with me today, but next time she would need to sit with the other kids. She calmed down right away and started participating and by the end I convinced her to sit in the floor so she could see the pictures better. Snappy Little Colors by Dugald Steer and Derek Matthews. You can *never* go wrong with a Snappy pop-up book! Pete the Cat: I Love My White Shoes by James Dean is fun because the kids get to identify what Pete stepped in, guess what color it turned his shoes, say "Goodness, No", and sing Pete's song, which kids really like. Pete is very popular with this age. Brown Bear, Brown Bear by Eric Carle has bright bold, illustrations and a very repetitive text, so the kids usually catch on quickly and join in saying the words. To make it even more fun, ask them what sounds the animals make. 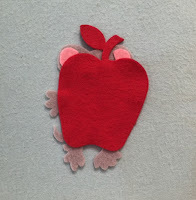 Lemons Are Not Red by Laura Vaccaro Seeger is a fun little book with cut-outs and mixed up colors. Short but sweet. Monsters Love Colors by Mike Austin is a fun book that uses cute little monsters to teach colors and show how to blend primary colors to make secondary colors. Where Is Green Sheep? by Mem Fox has the audience trying to find the missing green sheep, who turns up at the end sleeping under a bush. Also introduces contrasting terms. Mouse Paint by Ellen Stoll Walsh is a classic book about three white mice who get into the paint and discover how to make new colors by mixing red, blue, and yellow. Spicy Hot Colors by Sherry Shahan incorporates a few things from Hispanic culture and the Spanish words for the colors. The text can be a little awkward in a couple of places, though. Blue Chameleon by Emily Gravett stars a lonely chameleon looking for a friend who changes colors with each object he encounters. Some people really like this book, but I found it dull. Lunch by Denise Fleming shows a hungry mouse eating his way through several fruits and vegetables the kids can try to guess. I find the illustrations a bit too abstract for younger kids. We also used a few different activities. 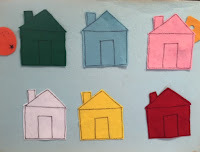 One was a felt board with different colored houses, similar to this one by Amy, and a mouse and random food items to hide behind them. 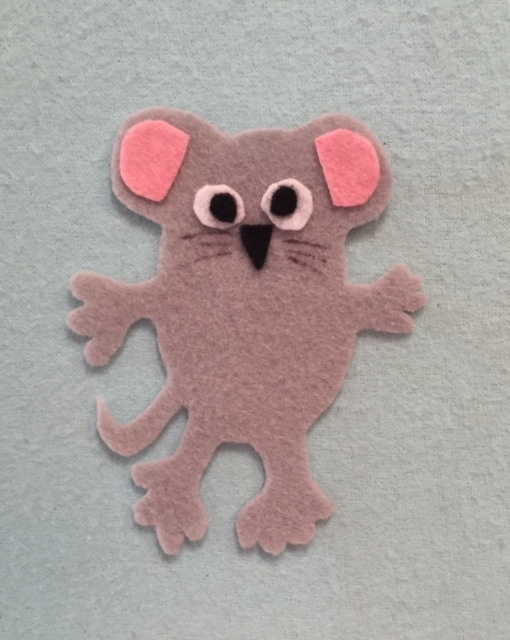 We would repeat the rhyme "Little mouse, little mouse; are you in the (color) house? ", then peel back the house to see what might be hiding underneath. With the smaller groups, I would have each child take a turn choosing a house to look behind. With the larger groups, we would just point and have the group say the color (for pictures of the actual flannel set I used and a more detailed description of how I used them, see Week 2). The second one was another cute flannel board with a rhyme about ice cream flavors and flannel pieces to build a multi-flavor ice-cream cone, as shown on Nikarella's blog post. I gave each child an ice cream scoop, then as we said each verse, they would each bring up the appropriate one and add it to our ice cream cone. At the end we counted our scoops. This is a nice simple song you can stretch out for as many versus as you like, and can modify to vary the action taken, or make it more specific, such as "If you're wearing red shoes...". All together, we visited 5 different daycares and provided storytime for 17 different classes. We had a lot of fun with this theme, and had a great selection of books and activities. I liked using Brown Bear, Brown Bear with the younger kids, especially the ones who were starting a new class or on the storytime bus for the first time since it is simple and repetitive and almost everyone has read it before. I though having a familiar classic would make them feel less apprehensive. 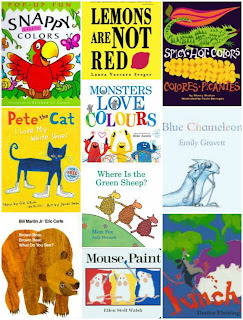 My personal favorites were Pete the Cat, which was a big hit and many were already Pete fans, and Snappy Little Colors which of course was a big hit since it had bright, bold pop-ups. 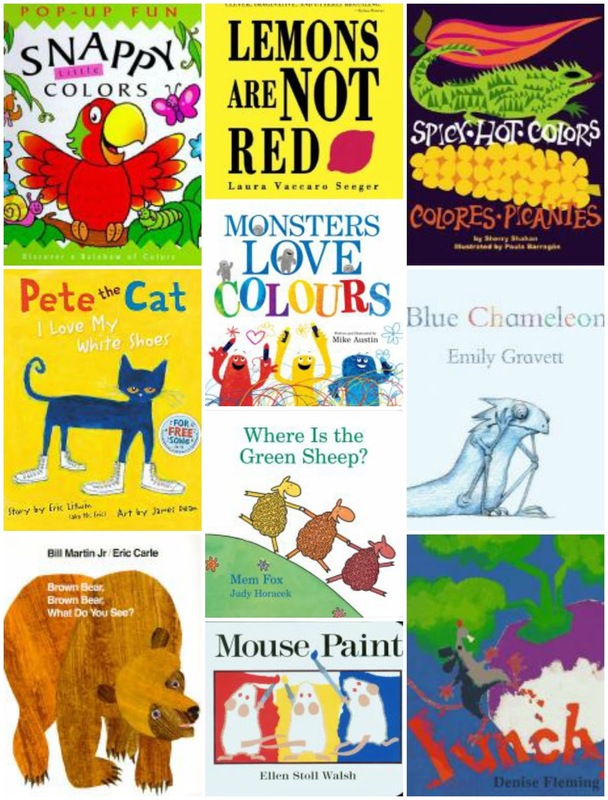 Other books that were received well were Lemons Are Not Red, Mouse Paint, and Monsters Love Colors. I only used Spicy Hot Colors with one group, and the kids weren't that into it, but I'm not sure if that was because of the book or because of a very disruptive boy who ended up having to be taken off the bus. Blue Chameleon and Lunch got mixed results, working okay for one group, but falling flat with others. I find Blue Chameleon a little boring and the illustrations in Lunch are colorful, but some are too abstract for younger kids, and it's hard to draw them in when the very first food is a turnip, which none of them can relate to. All the groups like the "If You're Wearing..." song, and it was cute to see how they would grin and get excited when they had on the color mentioned. Both the mouse house and ice cream flannel boards where a big hit. They loved the suspense of looking for the mouse, and who doesn't like talking about favorite flavors of ice cream! This was the week the kids moved up to the next class at the daycare, so I had several new faces. Since we are starting over with a new group and younger kids, I'm dropping down to 2 books and a 20-minute storytime for a while, and as they settle in and learn the routine I will increase to 3 books and 30 minutes. I decided to go ahead and use the shapes theme that we did on the storytime bus a couple of weeks ago, though I did select some different books. I thought it would be good to focus on a basic concept at the beginning of the year. Also 3 books about shapes is a little monotonous, so it would be good to use it when I would be planning a shorter storytime. We started with the usual welcome song and introductions, except that we sang the song twice since it was new for most of them. Then we did the "story song" and reviewed proper storytime behavior. 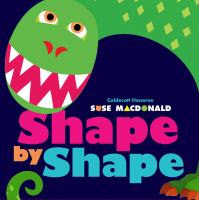 For our first book, I chose Shape By Shape by Suse MacDonald because (1) It is short and simple, just right for young 3 year-olds, (2) It's cute and interactive, and (3) The kids on the Storytime Bus really enjoyed it, with some classes even asking to read it again. The one criticism I have of this book, is that Brachiosaurus was an herbivore and did not have sharp, pointy teeth. Being a science major, these kinds of inaccuracies really bug me. Do you know what shape this is? What shape this is, what shape this is? Then I would hold up a shape (I had circle, square, triangle, rectangle, diamond, star, heart, & oval) and see if they could name it, count the sides, and name the color. We also discussed how to distinguish a square and rectangle, circle and oval. 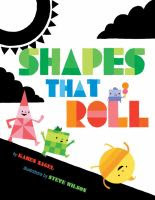 After that, I read Shapes That Roll by Karen Nagel. I chose this book because it had a nice rhyme and rhythm, and bright, shiny illustrations and cute shape characters. I also liked that it had a mix of geometric and irregular shapes, as well as introduced 3D shapes and distinguished between circles and spheres, squares and cubes. It can be interactive as well, by having kids name the shapes and discuss what shapes will roll and what will stack. After we read the book we discussed how you can see shapes all around us everyday, and pointed out different shapes in the classroom. Then we ended with our closing song and smiley-face (circle) hand stamps. I had a larger group than usual, with 13 kids at the beginning and 2 more joining us about mid-way through. I've typically only had 8-10 the last few months; I think everyone's eager to get up and get going at the beginning of the school year, then seem to start coming in later and later once cold weather hits. The group had about 6 kids that had been in the class all year, and the rest were the ones who had just moved up, so were probably all just barely 3. As expected, with all the newcomers and the overall age of the class being younger, they were full of energy and very excitable and talkative. The veterans of the class were excited to see me and introduce their new classmates to me. So now I have a lot of new names to learn, which the teacher was kind enough to help me with by giving them nametags. I told the senior class members they were going to have to be sure and help teach the new kids our songs and routine, and they did their best, singing the regular songs nice and loudly. As I expected, they really liked Shape By Shape a lot. They were very cute, showing their wide, crescent smiles, and fierce expressions. I wish I could find another book like that, that sequentially builds something one shape at a time with the kids guessing what it will be each step. I've seen some somewhat similar, but none nearly as good. They seemed to really enjoy the "Do You Know What Shape This Is?" song, but kept getting louder and louder with each one! I had to stop halfway thru and remind them not to shout so loudly and disturb the other classes. They do not know their shapes really well as a group, but there was always at least one kid who knew each shape. Shapes That Roll was just a bit too long; they liked it, but their attention did wane in and out. If it had been later in the year I think they would have been fine with it, though. At the end I told them to listen up because I had some homework for them. You should have seen their faces ;) "Homework??" they said, incredulously. I told them for the rest of the day I wanted them to pay attention and notice all the shapes they could see around them, and gave examples of some in the classroom: the circular clock, rectangular windows, the heart on one person's shirt, and the star on another. Then I gave them hand stamps and got lots of hugs. I have to say, they really lifted my spirits today. I was not feeling well at all and was really dragging this morning, but I completely forgot about feeling crappy while I was there and felt energized when I left. I love going to see this group! What Pet Should I Get? by Dr. Seuss. July 28, 2015. Random House for Young Readers. 48 pages. Ages 3-7. Unfortunately this came out just after I did my pet storytime, although truthfully at 48 pages it would probably be too long for my crowd anyway. In this story a brother and sister are going to the pet store to get a new pet. However, their mom wants them back home by noon, so they have to make a decision quickly. First they think the decision is simple, dog or cat. But wait, maybe they want a puppy or kitten? But as they look around the realize there are many different kinds of pets. Birds, bunnies, fish....how do they choose? Their considerations then begin to evolve from the usual pets to the more exotic. So many choices, and they must decide soon, their mother wants them home before noon! In the end, they finally decide on a pet, but the reader is left in the dark as to what they finally choose, only seeing them carrying a covered basket out of the store with two eyes peeking out. I'm a sucker for Seuss, so of course I liked this book with it's classic Seussian rhyme and illustrations. I know some people don't agree with posthumous publications, but after reading the history at the end of the book, I'm convinced this was a true Seuss manuscript and was close enough to being finished. The end of the book provides some history and context to the story, including pictures of Dr. Seuss with some of the pets he had over the years. It explains how the manuscript was found, and had complete black & white drawings, with small pieces of paper containing the typed text taped to the drawing to show how Seuss wanted it placed. The only thing lacking was instructions regarding how he wanted the illustrations colored. It describes how they analyzed the drawings to determine the approximate time period it was written, and believed that is was between an earlier period when Seuss used only primary colors and a later period when he used a much wider and more varied color palette. Therefore, the editors chose a color palette that bridged the gap between the two styles, using mostly primary colors for the backgrounds, but using some blended colors for the characters. While I wouldn't say it's a must-read, I did enjoy it and feel other Seuss fans will too. It would be especially good for children whose families are considering getting a pet and discussing what kind of a pet they want to have. At 48 pages it would probably be a little long for a preschool storytime, but it should work well for 5-6 year-olds and could spark a discussion about what pet they think the kids in the book ended up choosing, or what pet would *they* choose if it were them.